On this date in our family history . . . the 16th day of September . 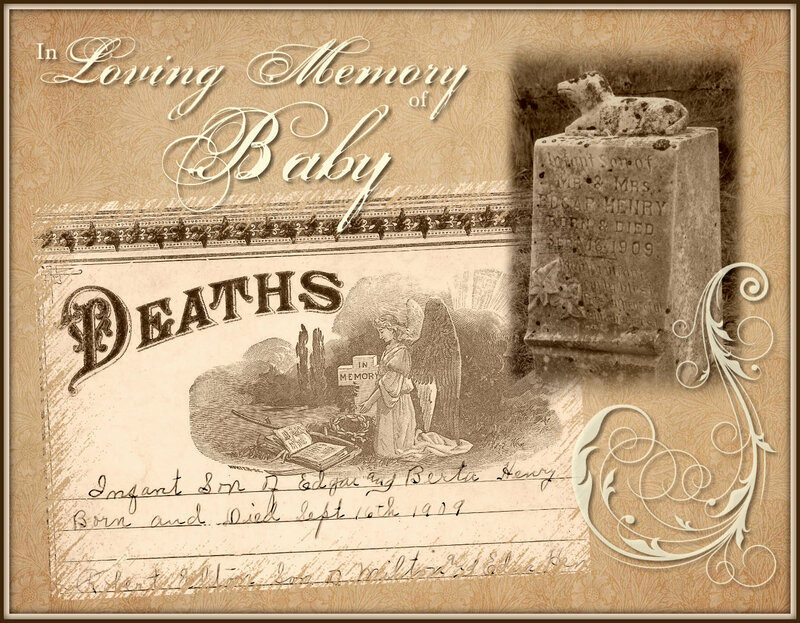 . . in the year 1909 . . . a baby boy is born in the Bethlehem community (Milam County, Texas) to Edgar and Berta Mary (Sharp) Henry . . . that baby dies the same day . . . and is laid to rest near his paternal grandmother in the Murray Cemetery in Milam County . . . this baby boy is a grand-uncle to the Keeper of this family history blog . . .
Fifty years ago today . . . on the 7th day of September . . . in the year 1964 . . . Emma Patience Muston nee Nettles dies in Rockdale, Milam County, Texas . 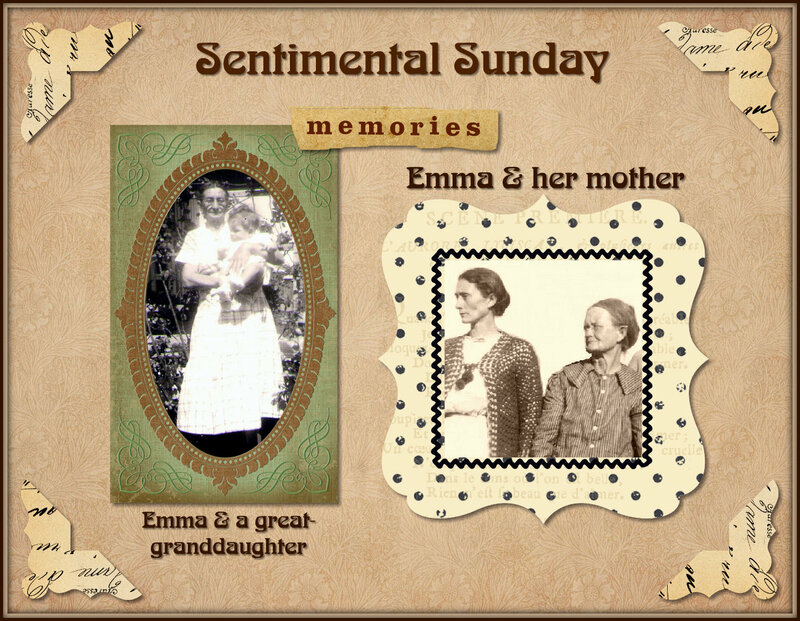 . . Emma was a great-grandma to the Keeper of this family history blog . . . and is shown holding her in the photo on the left in the collage . . .
On this date in our family history . . . the 6th day of September . . . in the year 1676 . . . John Porter dies in Salem Village, Massachusetts . . . he leaves a widow, Mary, and several children, including a son named Samuel, who is a 9th great-grandpa to the Keeper of this family history blog . . . according to American Biography: A New Cyclopedia, Volume 5 edited by William Richard Cutter . 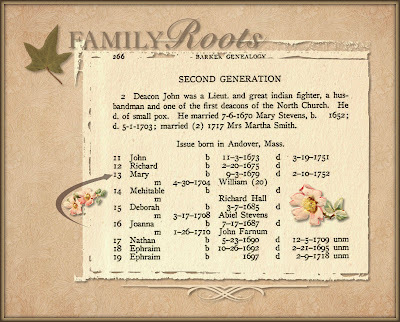 . .
From England came John Porter, born in 1596 . . . he built his first New England home, and there he lived until 1644, when he removed to Salem, settling in that part now Danvers. He had other lands granted him in Hingham, and held several offices of trust, both by election and appointment, and as a deputy to the General Court, May 20, 1644, represented the interests of his neighbors of the Hingham district. He also held the then very important office of constable. Although he bought the farm of Rev. Samuel Sharp, of Salem, May 10, 1643, he did not move to Salem until the following year, and his name does not appear in the list of members until 1649. The house which he built and occupied stood, no doubt, on the Sharp farm, near the site of the Unitarian church, and there remained until destroyed by fire about 1850. He bought several tracts of land in Salem, built a saw mill, was a man of energy and influence, well known in the colony as a public official. He again sat in the General Court in 1668, representing Salem, and finally, on September 6, 1676, passed to his reward, at his home in Salem Village. . . .
John Porter left a will dated April 28, 1673, in which he divided his property among his children, after generously providing for his widow. . . .
Three hundred and twenty years ago today . . . on the 5th day of September . . . in the year 1694 . . . "Daniel Merrill & Hester Chase, now Married were fined 40s each for fornacation" . . . In Reports of Cases Argued and Determined in the Superior Court of Judicature for the State of New-Hampshire, 1827, it is stated that an "adulterer and adulteress shall surely be put to death" . . . the same book has the following to say regarding fornication . . .
By an act of the colony of Massachusetts, passed in 1642, it was ordered, "that if any man commit fornication with any single woman, they shall be punished either by enjoining marriage, or fine, or corporal punishment." Col. and Prov. Laws 115. By an act of the province of Massachusetts, passed in 1692, it was enacted, "that if any man commit fornication with any single woman, upon due conviction thereof, they shall be fined, &c. not exceeding the sum of five pounds, or be corporally punished by whipping, not exceeding ten stripes apiece." Col. and Prov. Laws 239. As of this date, no record has been found of the date and place of their marriage . . . but the birth of their son, Joseph, was recorded as being the 28th day of May in that same year . . . this Joseph is a 7th great-grandpa to the Keeper of this family history blog . . . bet his parents never thought this tale would still be being repeated three centuries after-the-fact! . . . and don't you have to wonder who had the job of keeping track of dates of marriage as compared to dates of birth?!? On this date in our family history . . . the 5th day of September in the year 1793 . . . the will of Henry Tate is probated in Campbell County, Virginia . . . aka Henry Tayte, this man is a 6th great-grandpa to the Keeper of this family history blog . . .
On this date in our family history . 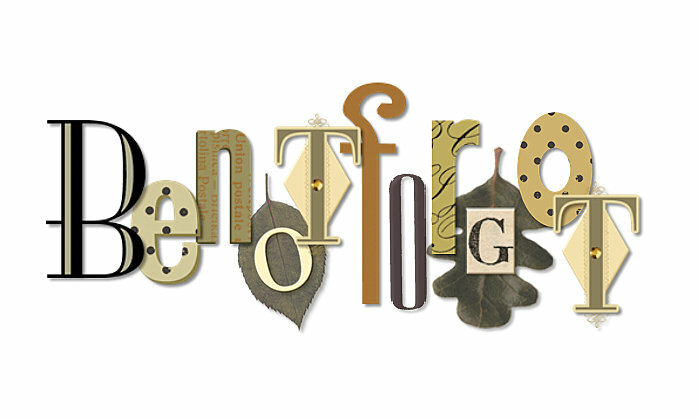 . . the 3rd day of September . . . in the year 1679 . . . Mary Barker is born in Andover, Essex County, Massachusetts . . . her parents are John Barker and Mary Stevens . . . little Mary will grow up to marry her first cousin, William Barker, Jr., who is a son of William Barker, Sr. and Mary Dix . . . Mary (b. 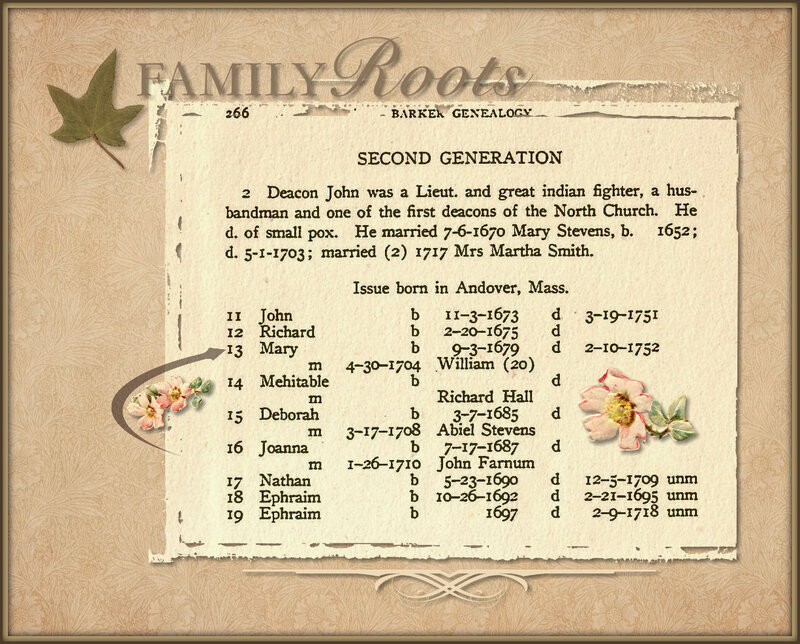 1679) and William, Jr. are 7th great-grandparents to the Keeper of this family history blog . . .